I used to believe the old wife’s tale about Lady bugs being good luck until they swarmed my house by the thousands. By ones and twos those little beetles are cute. Multiply them a few times and… not so cute anymore. The lady bug does no harm to humans or human possessions. But it does devour hordes of harmful insects, including a variety of plant lice. About the only problem this lady of the insect world may cause you is that it sometimes makes a nuisance of itself during cold weather when it hibernates around windows or between the inner and outer walls of a house. It often chooses a spot near buildings because it’s cold enough there to allow hibernation without being cold enough to kill it. It spends the winter in a state of suspended animation and will only wake up again when the weather is warm enough. In fact, if the lady bug warms up too quickly, it could be fatal. The bugs’ ability to hibernate during cold weather and it’s characteristic of gathering in large numbers is put to good use by some fruit growers and other farmers. The hibernating beetles are collected then kept in cold storage until spring when they can be shipped for use in orchards and farms eating insects that damage the crops. This allows a reduction in agricultural insecticide use. So you see, some lady bugs around the house (not necessarily in the house) can be a good thing for your garden, ornamental shrubs and fruit trees. The Bug Runner or any other licensed pest control company cannot treat for lady bugs with a pesticide. 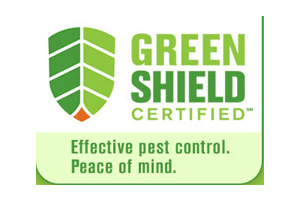 We are bound by our licenses and certifications to abide by all regulations associated with pesticide use. At this time lady bugs are considered a beneficial insect and no pesticide is labeled for their control. Our control measures are limited to vacuuming them up to release outdoors. To draw the lady bugs to one area and make the job a little easier, place a light on the floor in one corner of the effected room, with window shades closed, and they will congregate around the light. When we come up with other solutions or if labeling changes we will update with that information. Copyright © 2019 The Bug Runner Exterminating Company | All rights reserved.